The embryonal carcinoma (EC) cell line 1003 forms multidifferentiated tumors when injected into syngeneic mice but is apparently nullipotential when grown in vitro in conventional media. 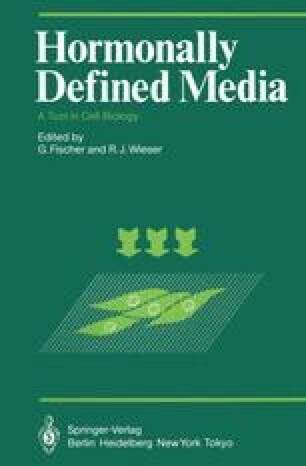 Hormone-supplemented defined media were designed as an attempt to mimic in vivo conditions. Such media actually allowed 1003 cells to differentiate in vitro. The phenotypes eventually obtained depended upon the composition of the medium. Both diffusible factors and attachment factors were shown to control the differentiation of 1003 cells. The appearance of differentiated phenotypes was found to be due to induction - and not selection - phenomena. However, because of the impossibility to obtain clonal cultures of 1003 cells in serum-free media, experiments allowing to find out whether the extracellular environment exerts its effects on these cells at the level of determination or at the level of terminal differentiation could not be designed.